""Hey, that thing got a HEMI??"" YUP!!! 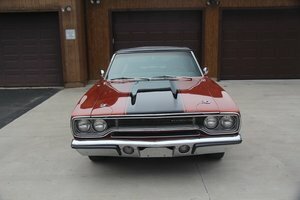 In The Height Of The Muscle Car Era, The Hemi Road Runner Stood Head And Shoulders Above All For Its Pure Brute Force. Some Were Used Up And Some, In Later Years, Lovingly Restored To Become An American Muscle Car Icon. This Is An Example Of One Of Those! Only 234 Road Runners Made With This Engine And Transmission Combination For This Model Year. "https://www.youtube.com/watch?v=m-l7qJcuBa8"" frameborder=&quot;&quot;0"" allow=&quot;&quot;accelerometer; autoplay; encrypted-media; gyroscope; picture-in-picture"" allowfullscreen>&rel=0"